15% OFF ALL COUNTER AND BAR-TOPS!!! For the year-round pleasure of living with the beauty and durability of Mesquite, consider a one-of-a-kind Mesquite hardwood floor made from rescued or salvaged Mesquite trees. The Sekula Sawmilling Company based in Falls City, Texas, has made custom Mesquite floors, counter tops, stairs and even wall paneling since 1999. 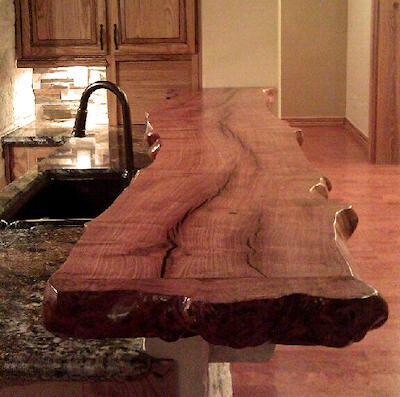 The craftsmen harvest the reclaimed Mesquite lumber from farmers and ranchers throughout South Texas. 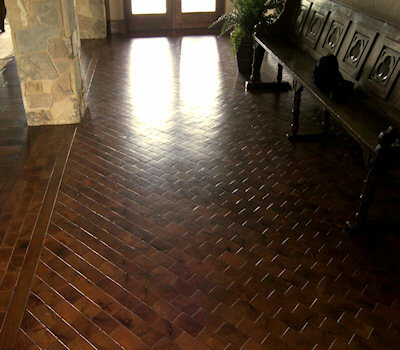 Mesquite wood is a blend of rustic elegance and unique character. From Rustic and Cozy to sophisticated and modern, a Texas Mesquite floor can set your project apart making it both unique and beautiful. The American Hardwood Association classifies Mesquite as REPLENISHABLE. Our Mesquite lumber is harvested from rescued or re-claimed Mesquite trees on ranches and farms throughout South Texas. Clearing land free of charge saves farmers and ranchers money and makes practical and efficient use of a wood that would otherwise be destroyed. That makes our production method a "GREENER" alternative to imported exotics. Sekula Sawmilling works directly with ranchers to harvest the cleared Mesquite Wood. Our Mesquite is harvested and milled right here in the great State of Texas and delivered to your jobsite, straight from the mill. No middle man means the best possible prices and environmentally streamlined production. Mesquite Wood is A HARDWOOD CONTENDER! 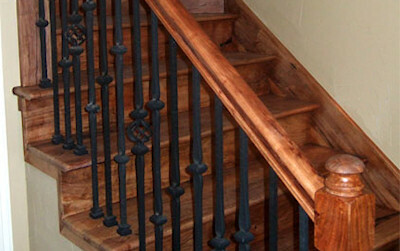 Teak, Mahogany and Mesquite are equally ranked as the most stable hardwoods in the world. Better than Oak! From wet to dry Mesquite wood loses less than 5% of its overall volume while other woods lose in excess of 15%. 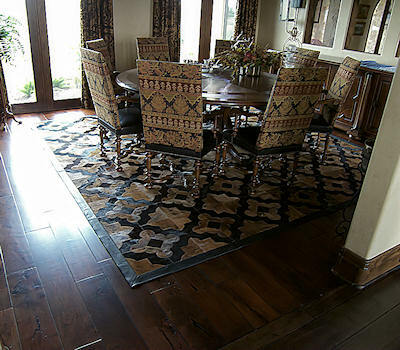 This means a Mesquite hardwood floor is much less likely to move during extreme weather changes. That stability to the consumer means this wood will perform well in any climate hot or cold, humid or dry. The wood does not degrade in any weather condition. Anyone, anywhere in the world, can use Mesquite wood to enhance the beauty of their hardwood flooring project and expect it to perform when properly cared for. The Mesquite trees that grow in South Texas are distinguishable from those growing in Mexico or Argentina. The arid climate of South Texas gives Mesquite more character and a brighter display of color, approximately seven shades, compared to its counterparts south of the border. Mesquite grown in Mexico and in Central and South America generally are homogenous in color, one or two shades of a "chocolate" brown is probably what one will find if they purchase flooring made from those trees. 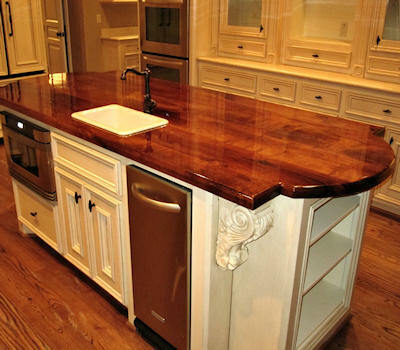 A Mesquite CounterTop or Mesquite hardwood island can set your kitchen project apart making it both unique and beautiful. 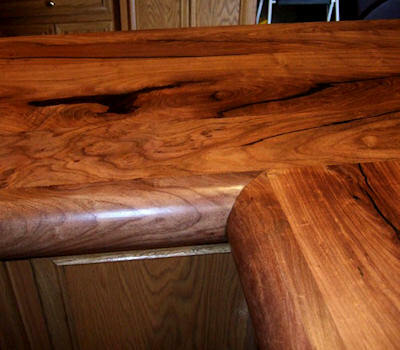 Mesquite hardwood countertops are twice as hard as oak and twice as durable. 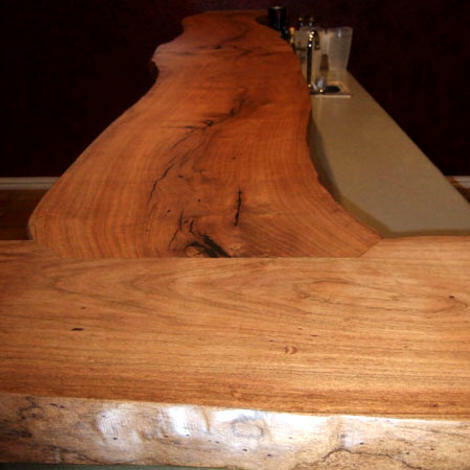 "What strikes me about Texas Mesquite wood is the range it has as far as possible effects. It can go light, dark and contrast but still remain uniform because of that deep rich color. This really is one of the most unique woods I have ever seen in use." The low moisture content of Mesquite allows the wood to withstand even radical seasonal moisture changes in its environment. As the Mesquite wood ages, it darkens and tends to develop deep reddish hues. The graining is so unusual and interesting that it is a favorite material for carvers, so a floor or stairway made from this exquisite character wood will be a conversation piece. 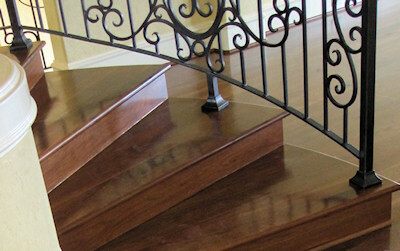 Mesquite Hardwood Stairs are a unique and beautiful accent that can set your entry way or living room apart. Over the years, we've expanded our product line to include not only Texas Mesquite flooring and stair components, but dozens of other Texas Mesquite wood products as well - countertops, bar tops, Mesquite furniture and Mesquite hardwood paneling. Keeping the entire process in one family-owned hand makes the products affordable and the purchase very personal. Sekula Sawmilling's reputation and quality of work has created such a "buzz" among designers and specifiers that most clients come to their doors through word-of-mouth. For a zero-middle-man purchase from tree to your home, you can also call the company directly and the staff will be happy to find out what it can do for you. As the manufacturer, we harvest, process, custom mill and sell Mesquite wood products directly to our customers. Buying mill direct allows you to save thousands of dollars otherwise spent on "middle-man" mark ups. As a custom mill, all our products are tailored to suit the customer's individual needs. Whether you're a business or homeowner, Sekula Sawmilling Company will deliver a unique, quality product with integrity to back it up. Customer satisfaction is our most important goal. MESQUITE - The Made in USA - EXOTIC HARDWOOD!